Gov. Bill Lee meets with the media after speaking at a Chattanooga Area Chamber of Commerce luncheon at the EPB building downtown on Friday, March 22, 2019 in Chattanooga, Tenn. Updated at 5:57 p.m. on Wednesday, March 27, 2019, with more information. NASHVILLE — Gov. 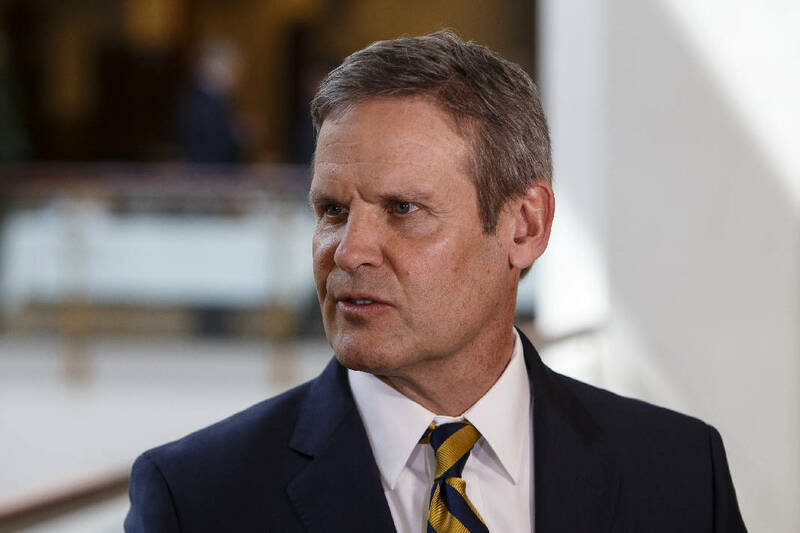 Bill Lee's controversial Tennessee school voucher proposal won approval Wednesday in the House Education Committee, but the governor and some of his fellow Republicans had to make several concessions to get a passing grade. The GOP-led panel approved the bill after more than two hours of testimony and sometimes-heated debate on a 14-9 vote with one Republican abstaining. But before that, members approved a last-minute major rewrite of the bill to soften opposition among enough Republican critics to get the bill through. Republican House Speaker Glen Casada himself came into the committee and voted yes to ensure the bill's passage. * Parents who want to home-school their children are no longer included. * To address a new controversy over illegal immigrants' participation, the bill seeks to detour around legal issues of exclusion by requiring parents to provide government identification so their "education savings accounts" can be successfully audited by the state. * The number of students eligible to participate is now capped at 15,000, deleting the original bill's provision that after the fifth year another 1,000 students a year could be added. Two Hamilton Countians, meanwhile, appeared before the panel to take opposing sides on the legislation, which would create the limited "education savings account" program. It would allow parents, based on income qualifications and who live in districts with at least three public schools falling in the bottom 10 percent in terms of education performance, to use the money to attend private and religious schools. Hamilton County school board member Jenny Hill urged lawmakers during testimony to reject the bill. Don Holwerda, a former principal and administrator at the private Chattanooga Christian School, meanwhile, called for its passage. In a later statement, Lee hailed the bill's advancement, saying, "Tennessee can be a leader in education. [Education savings accounts] put our students first, strengthen our public education system and provide choices for those who need it most. I am pleased with the momentum we have seen in the House today." While presenting the bill, House Speaker Pro Tem Bill Dunn, R-Knoxville, thanked Lee for pushing the bill, which is aimed at current public school students or children about to enter a Tennessee school for the first time. "It's very student-focused," said Dunn, a longtime voucher proponent. "It's something that Gov. Bill Lee ran on. He was elected by [an] over 20 percent margin of victory." The governor's bill would impact the Hamilton, Knox, Davidson, Memphis and Jackson-Madison school systems, as well as the state-operated Achievement School District, which has a number of low-performing schools in Davidson and Shelby counties. The administration expects to award an average of $7,300 in state dollars directly to the parents in the education savings accounts, dubbed ESAs, that families could use on private school tuition as well as for associated education costs including tutoring, transportation, school uniforms and computers. But it also would sweep up local tax dollars used to support the departing students. Lee wants to devote $125 million in public funds over a five-year period to the program. Up to 15,000 students would be eligible by Year 5. Impacted school systems would split $25 million in grants from the state to make up for the losses during the program's first three years and $25 million in subsequent years devoted specifically to their failing schools. Ability to qualify for an ESA would be tied to parents' incomes under federal free and reduced-price lunch programs, a measure of poverty. But Lee's plan would allow parents who earn twice as much as the free lunch program to qualify. Hamilton County school board member Hill told lawmakers "we are very concerned about the way that this bill does not, as it is written, protect students or families. Nor does it improve education." She noted that while it ostensibly targets low-income students in low-performing schools, it actually would allow higher-income families in schools that are doing well to participate, too. "Right now, this bill in its current form, it qualifies students whose families make double the amount for free lunch," Hill said. That would enable families making $66,000 a year to participate when the average income in Hamilton County is just $47,000, she said. "If we care about low-income students, we should only qualify students whose families are eligible for free lunch," Hill said. "This bill, with this income qualifier, does not make it a low-income bill. It makes it a middle-class entitlement bill. And I clearly hope that none of you here today are planning to set out to do that." Hill also noted that in Hamilton County, local taxpayers are paying nearly 50 percent of the total cost of education. She also noted that 20 percent of families are already sending their children to private schools where "top tier" schools can cost upwards of $20,000 to $30,000 annually. Holwerda, former principal at the private Chattanooga Christian School and now a church administrator, called for the bill's passage. "We served a lot of students from schools who need some help," Holwerda said, noting they were provided scholarships. "By and large they did very well and got out of a situation they had to get out of." Holwerda said he has spent 30 years working at Chattanooga Christian and now works with schools "needing help." "This year we're starting a micro school to help the students who are in failing schools to get out. There's no opportunity for them to get out. They're trapped. They've been that way in Hamilton County, five failing schools, for a number of years, and these parents are trapped. "And I'm coming simply to beg for the students that need help, who are not being served by the schools they presently have," Holwerda said. "This is not an anti-public school bill. Public schools are serving a need. We welcome them." He said the "irony here is I voted actually for Jenny Hill" for the school board. The bill now goes to the House Government Operations Committee. Senators, who have routinely passed voucher bills only to see them fail in the House, have yet to move Lee's bill. The legislation is presented in House Bill 939 and Senate Bill 795.